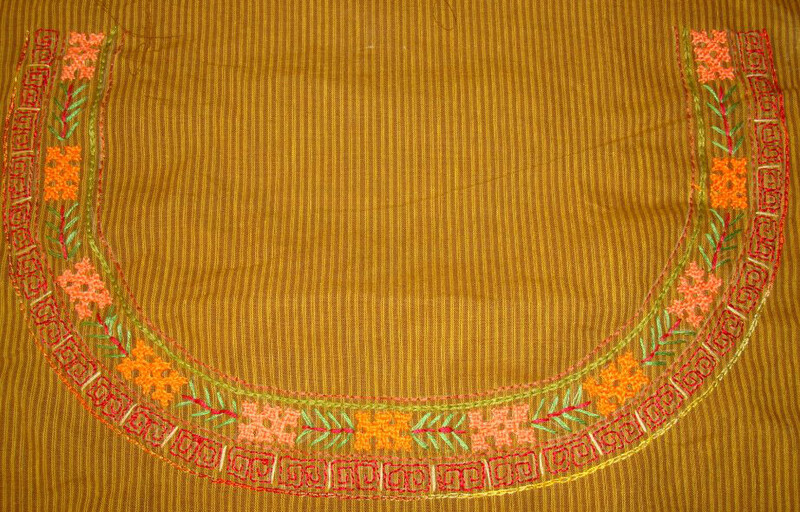 The embroidered fabric and the tunic were of the same colour, I felt it needed some more orange or red to give them some distinction. 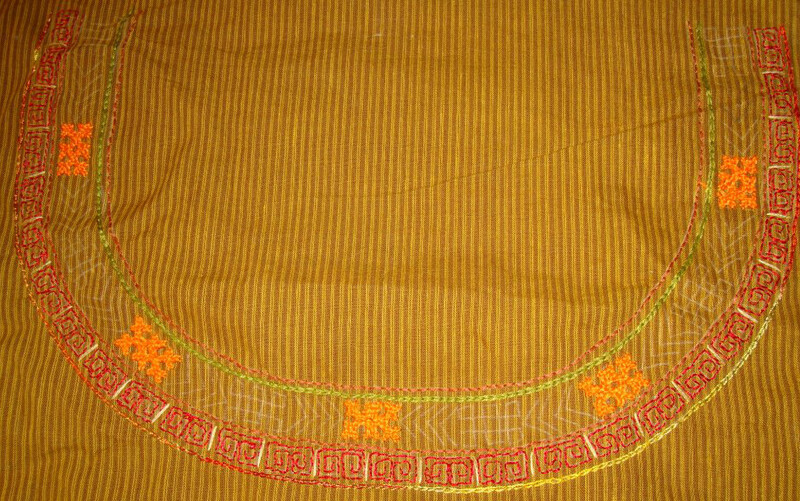 I asked the tailor to attach a small piping made of this bright orange fabric to the neck and sleeves, which he did beautifully. 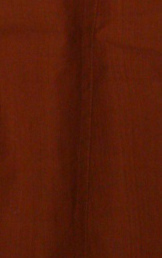 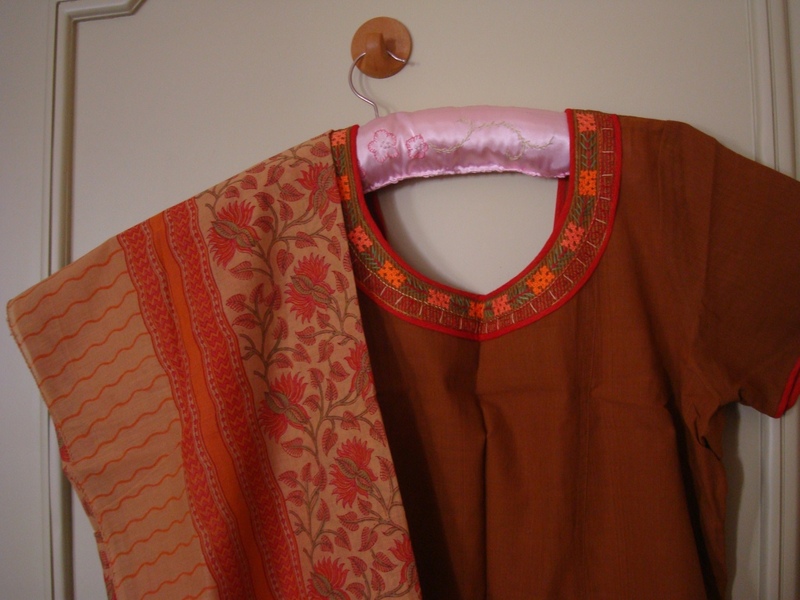 The tunic set with dupatta. 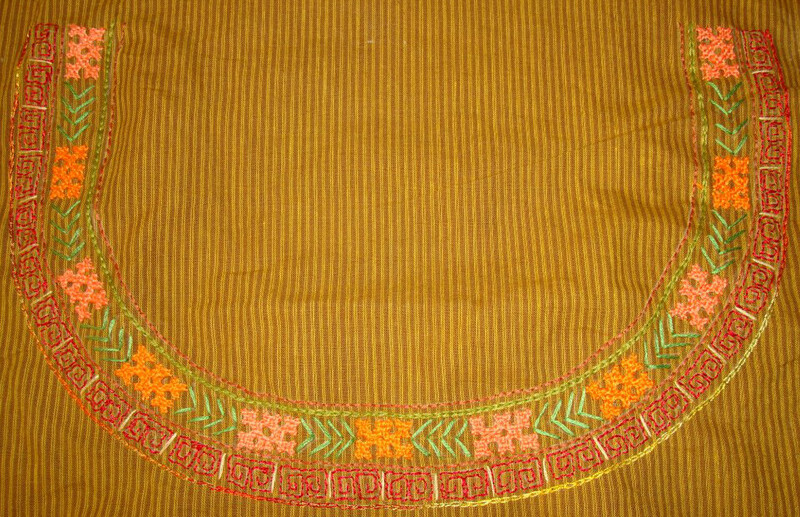 This tunic may not look as appealing as the cream tunic I saw at the shop, but I am happy! 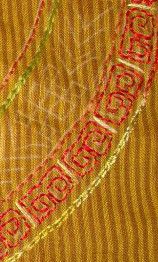 After working the fly stitches in three strands of green cotton floss, the mid line was worked in back stitch with red thread. 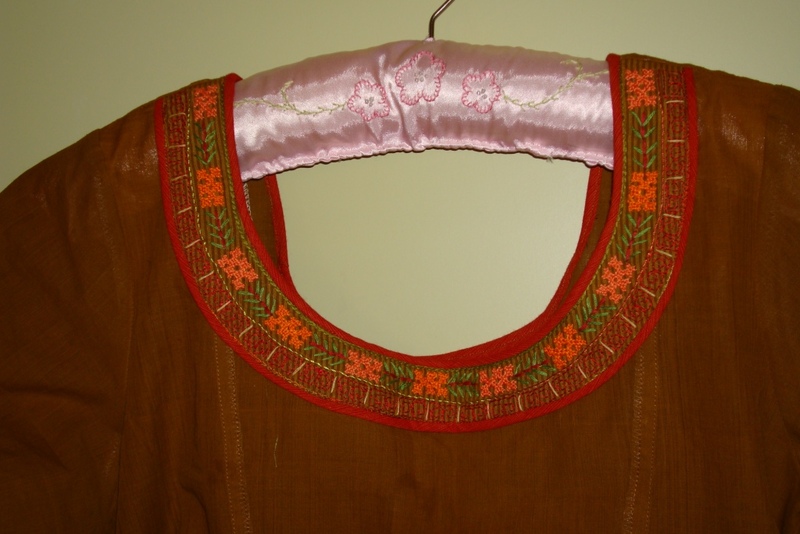 The alike kutch motifs on the neckline borders were worked in two shades of orange alternatively, after working with medium orange thread , the motifs were worked with light orange thread, I did not choose to weave these motifs, though weaving was possible. 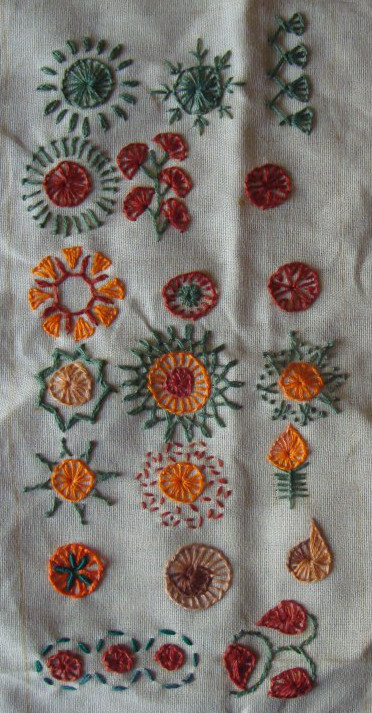 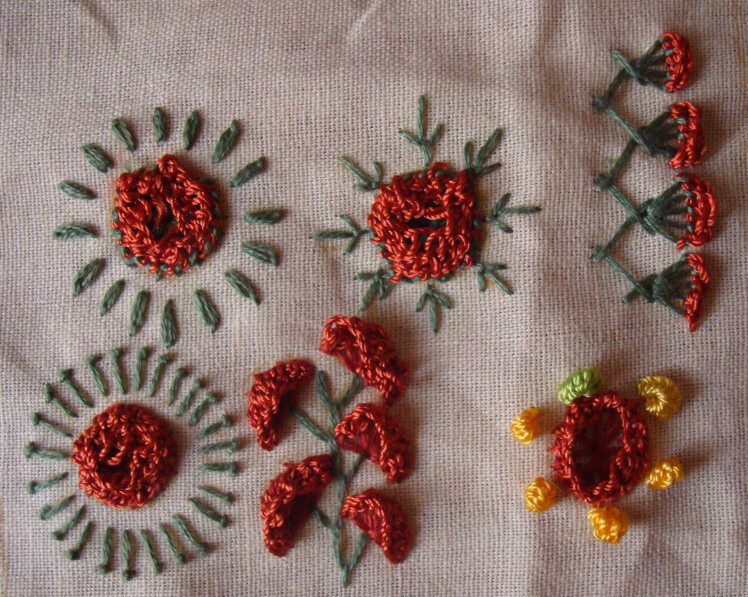 The geometrical pattern was worked in back stitch with red thread. 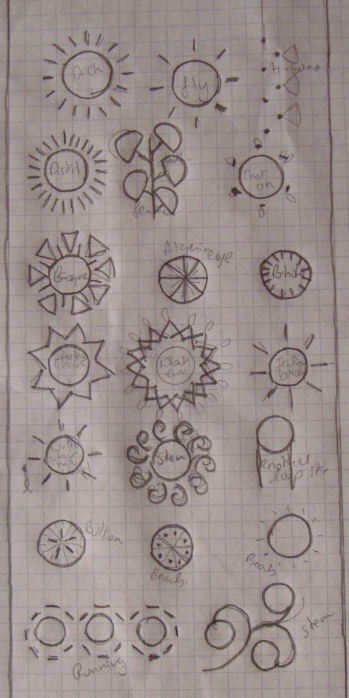 Another small picture. 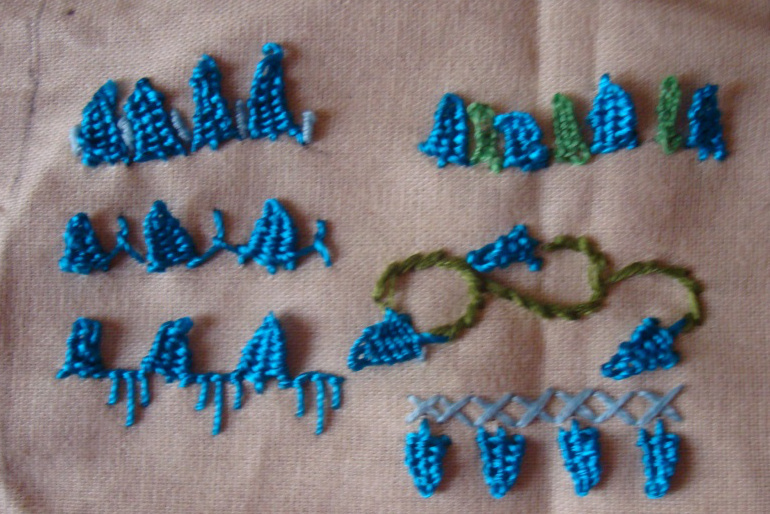 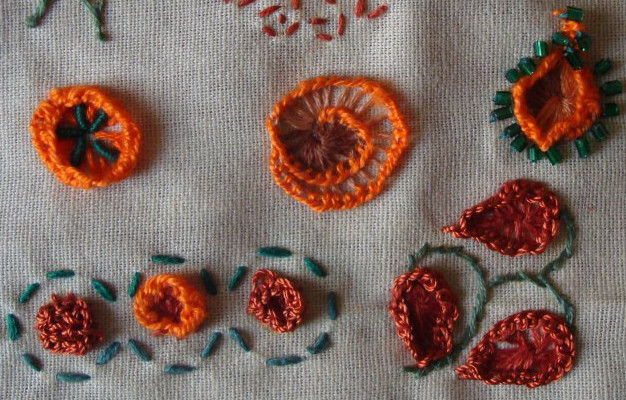 the outline was done in chain stitch with variegated silk thread. 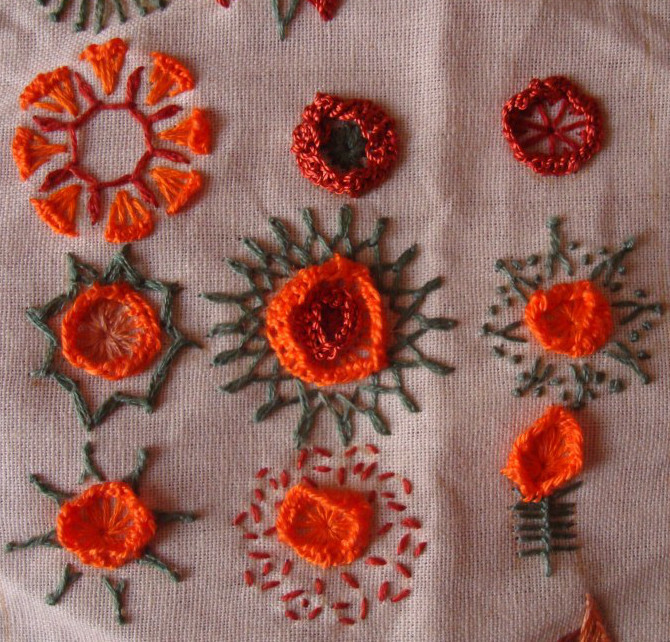 The other motif was worked in light[peach] orange. 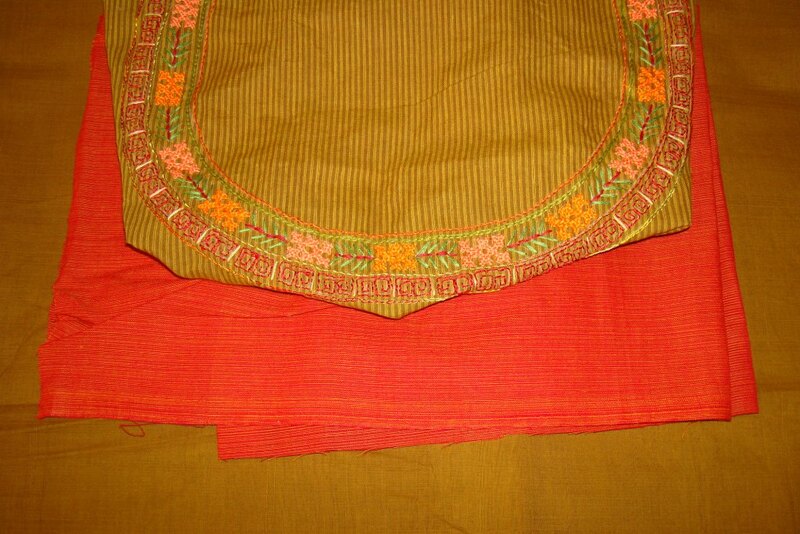 The dupatta was on display on the shop, along with plain cream salwar set[tunic]. 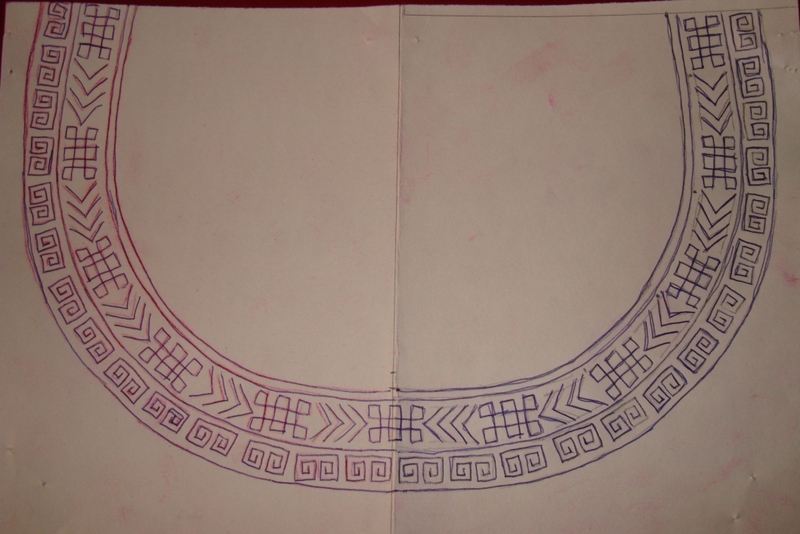 It was quite attractive. 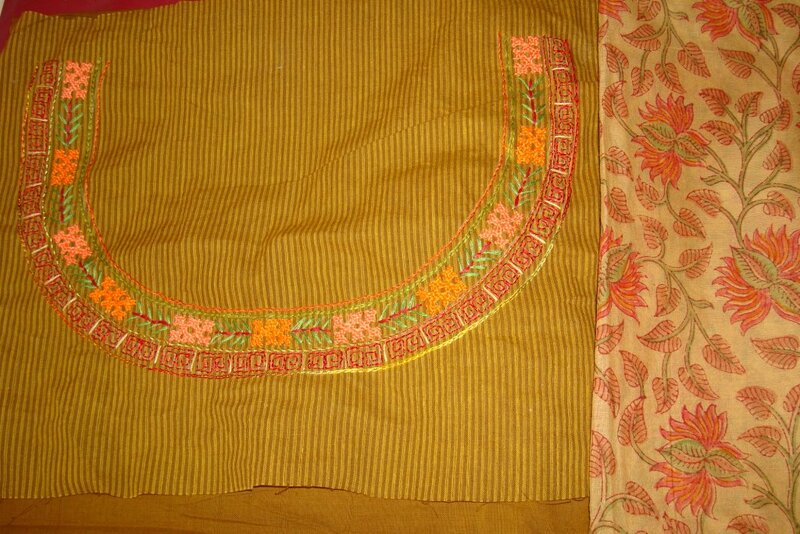 I took the dupatta alone and thought of embroidering a small border around the neck on a cream tunic. 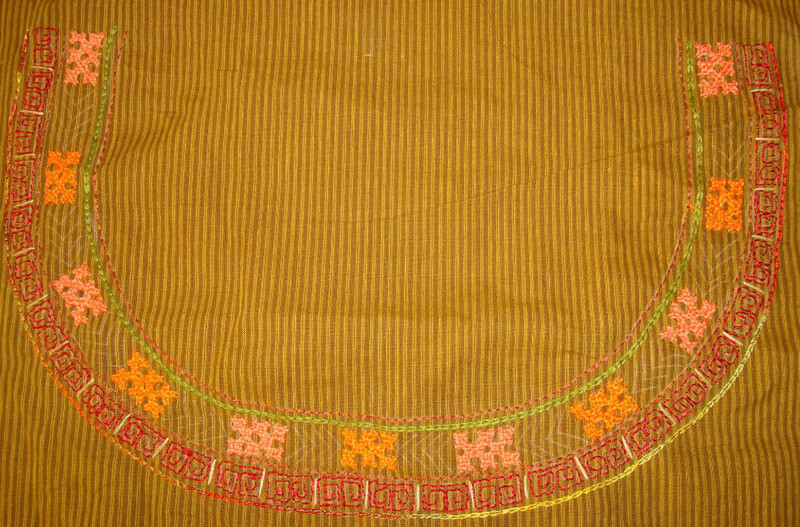 later thought that this combination was too common and discarded it and bought a plain brown[?] 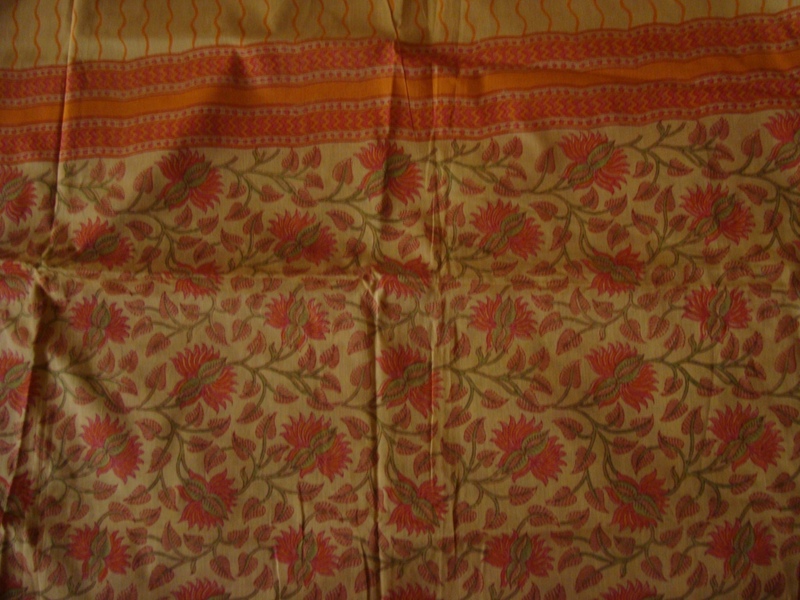 mangalagiri cotton.